Pack of 16---There are 16pieces professional nail files in the package,These black nail files work quickly to trim or shape the nail with your desired shape or length. 100/180 Nail files---These nail files are double sided 100/180 with round ends,ideal for toenail & finger nail care. Size---17.8cm x 1.9cm x 0.4cm.Portable to carry and easy package in bag. Easy to clean---They are washable and waterresistan,could be rinsed with antibacterial soap & disinfect! 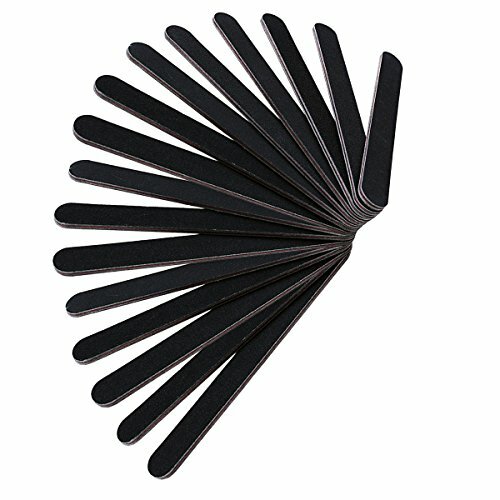 Salon black nail files---These high quality nail files are perfect for diy nail art at home,and daily finger nail care or using in professional salons.It could also be nice gift for girls.